NEW OWNERS AND NEW AMENITIES! ONLY ONE BEDROOM WITH RETRACTABLE SCREEN ON THE DECK! Relax on your private screened deck with brand new sofa sectional and cafe style table and chairs. Enjoy morning coffee, happy hour beverages or dine on this well appointed deck. Inside there is a new 40" HI-DEF TV in the living area supported by a sound speaker and Blu-Ray DVD player. For added fun there is an Atari game system with 110 classic arcade games. Great for a game of Asteroids in the evening! Our internet service here is upgraded with an extra booster in the bedroom for optimal streaming capabilities! The villa is appointed with hardwood floors through out the villa. The king bedroom suite features quality bedding and a second TV. A Bose radio offers evening music too! The sleeper sofa and 2nd full bath offer 2 accommodations for 2 additional guests. Both bathrooms are nicely updated! The kitchen features granite counter tops and quality appliances. The kitchen is well stocked for your pleasure and convenience. 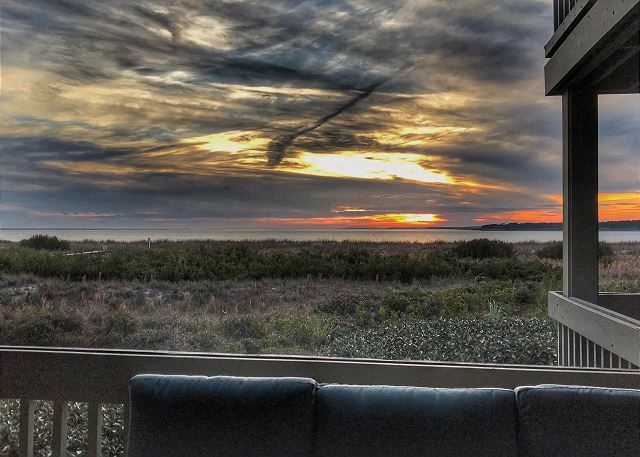 Join us for a magical stay at 1375 Pelican Watch! We enjoyed our stay in this rental. From reservations to departure, we received impeccable service. This unit is in excellent condition! The unit was attractively decorated and perfectly furnished. Everything you could want was provided in the kitchen: pots and pans, glassware, tableware, silverware, appliances. The furniture was comfortable as were the beds. Everything worked properly. Same great experience as always. You can always depend on Seabrook Exclusives properties to be clean and well appointed. The condo was very comfortable, clean and reasonably equipped. We were happy with our choice. We enjoyed this unit for the second consecutive year. We were so excited that it was available on the dates we requested. It was very clean and the owner had upgraded some furnishings since our visit last year. Absolutely beautiful! We actually had the pleasure of meeting and chatting with the owner who was staying in the other unit he owns. The staff at Pam Harrington was very accommodating, as the coffee pot was not working. They brought us a brand new one at 8:00 a.m. in less than 15 minutes. They really do care about their guests!! If you’re looking for very comfortable and beautiful accommodations, this is the unit. We will definitely return next year. Other than a noisy ceiling fan in the bedroom, our stay was excellent. The rental process and the quality of property management is top-notch. This is a very fine one bedroom villa. The furnishings are up to date and comfortable. The location is great. Thoughtfully appointed Villa. Paper products, dish and Laundry detergents are provided. Having previously owned at Seabrook this was familiar territory. Great to re-visit and the Pelican Watch facility was great. What a great place for a relaxing vacation. The villa was very comfortably appointed and well stocked with essentials. A good value for the money spent. Rental staff could not have been nicer or easier to deal with. Amenities - pool at the club, etc. were very nice and well maintained. Local restaurants at Seabrook and Bohicket Marina were all nice and not too pricey for family use. The Fat Hen Restaurant on Maybank Highway was EXCELLENT with the best fried green tomatoes and crab cakes I have ever enjoyed. The only problem was with the sliding glass door on to the patio - it did not have an exterior lock if you were leaving that way to go to the beach via the boardwalk. Will stay there again. We planned a quick 3-day jaunt. When the time came to praparento leave, we decided to extend another day. The staff at Seabrook Exclusives was so helpful and accommodating. This unit was nothing short of superb! We will definitely return. My wife and I spent our honeymoon at Seabrook Island 36 years ago this August. We have been back several times- this year in May to a little bit cooler and beautiful weather to a beautiful place. 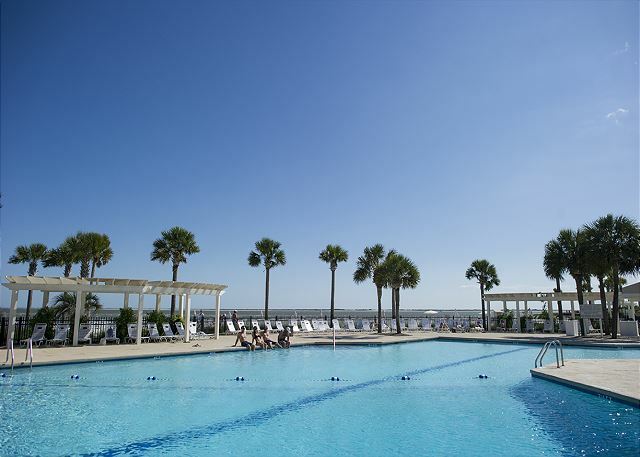 Seabrook is a great place for rest, relaxation and renewal. It is very scenic. You see great ocean front views, nature and wildlife there. Great golf, food and dining on the Island. I travel to Charleston, SC for pleasure and business throughout the year. During the summer months, I take my family with me and we stay at Seabrook Island. Pelican Watch is one of the best properties in terms of view and proximity to the beach. This unit is one of the nicest we've stayed in, and I recommend it. Also, Pam Harrington Exclusives never fails to give quality customer service. Hello, We had such a great time on our get away. We were able to bike, relax, and enjoy the quite. I want to apologize for not starting the laundry before we left. I did not read that on the letter until we were looking for the office to return the key. We will be back. Thank you!! We have visited Seabrook Island for the past 16 years. Pelican Watch provides an excellent location and view. Our condo was fantastic and we will plan on staying there again. Thank you for a wonderful summer vacation! We have rented 1375 multiple times over last 5-6 yrs. Everything wonderful..greatest location for two adults who love the beach, walk and surf only 3 star rating is because the dishwasher is noisy and getting old, and bring your own sharp knives and wine opener (theirs was broken this trip)...we had to buy one..we cook in the unit...we bring our own "gear" so we can prepare the freshest seafood we can get at the time...shrimp, flounder, crab..
Great time at Seabrook. Beautiful place. Very peaceful. 1375 Pelican is a very nice place. Granddaughter loved the equestrian center and riding Blossom the pony. Pool is not a short walk. It’s a short drive, but very nice once you get there. Just back from our third week at 1375. As usual it was wonderful. Great client services from Seabrook Exclusives. Prefer the canvas beach bag. Thank you so much for your review! I think you may have made an error for property condition, right? This is one of our loveliest properties! A wonderful stay with such a beautiful view. We wanted for nothing, everything was provided for us. The condo was lovely, the furnishings and decoration so pretty. We look forward to visiting again and we will certainly recommend this property to others. Thank you for making our stay so pleasant. 1375 Pelican Watch...our home away from home. We have rented this unit so many times....Pelican Watch and this unit is our go to get away. Seabrook Exclusives of Pam Harrington are the best. Thank you Kat, Betsy and Meredith (hope I spelled your names correctly)Everything was perfect..including new fridge! Great week and perfect weather. Been coming to Seabrook at least once a year for 20+ years and it's always like coming home. Tried other beaches and really tried to like others as well but just cannot. Lots of new upscale amenities on the island that appeal to some but unnecessary for me. I realize the cost of a seabrook vacation is partly because of those amenities but I just haven't found the peacefulness anywhere else. October at Seabrook was Awesome! We had a wonderful time. The unit was the nicest we have stayed in (we have stayed in several Pelican Watch Villas). It was clean and definitely the most well stocked. We will be back. 1st time to Seabrooke and we picked the best location at Pelican Watch, right on the beach. Condo was lovely. Would highly recommend to others. Very nice and great location! Exceptionally nice unit. Enough sun during day on covered porch and views of Edisto with trawlers and boats coming home for a post card shot. Saw dear on the dunes that thrilled the little ones! Our wonderful visit did have a few negatives. At Seabrook Exclusives's recommendation, we rented 2 bikes from Surfscooter. Surfscooter delivered the bikes to us one day late because they had delivered them to the wrong address. Renters in 1376 Pelican Watch continued to use the bikes we had rented for a day after the mistake was discovered. We talked with Surfscooter and they were reluctant to refund 1 day's rent on the bikes even though they were charging us extra for the 3 days past the normal week's rental (we stayed 10 days). Surfscooter should have changed the padlock on the bikes so that only we could use them. Their suggestion to us was to move the bikes to another bike rack which was much less convenient. We did move them, however. We would not use Surfscooter again. We left Croc sandals outside our front door to avoid tracking sand inside. They were stolen. There are thieves in paradise. The drier makes a squeaking noise when running and should be fixed. We would still return to this unit. It is lovely, comfortable, and well located. Thank you so much for your stay with us! I am so sorry you had difficulty with your bike rental. Next time you visit with us, please remind us and we will seek a discount for bikes. We had a wonderful time and will return as soon as we can! and I have visited Seabrook several times and it was one of our favorite units. One thing to note was that we could not turn on the 2nd shower. We only needed the main shower, so it did not matter for our stay.